This has not been a good season for this Tragic Don. 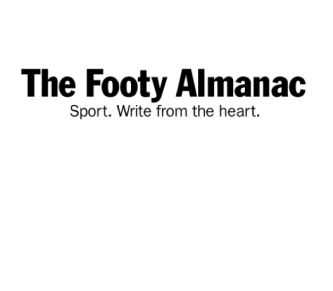 The previous worst season for The Essendon Football Club was 1933. I wasn’t even born then. My dear old Mum and Dad hadn’t even met. They were both at school. I can imagine there wouldn’t have been too much joy in Mum’s Essendon household at that time. On the other hand Dad had not been converted to a Don in 1933, so he probably didn’t feel any pain. I watched the Don’s win against Melbourne in round two, but then it was week after week of good trying from The Dons, but getting thumped. And getting thumped by the old enemies like Richmond, Collingwood and Carlton is no fun. But on Saturday things turned Rosy. We beat Carlton. And what a joy it was to watch those lads in the Essendon jumpers prove too skilful, too fast and too committed as a team for The Blues. How great it was to cheer players who have been given a second chance at Essendon and watch the young recruits at the club show such promise. To be honest I thought this game would turn out badly for The Dons, but apart from the first five minutes when Carlton scored a couple of early goals, until three quarter time, it was all Essendon. It’s unfair to pick out players when everyone was so committed, but Darcy Parish, Zac Merrett, Anthony McDonald Tipungwuti, David Zaharakis, Mitch Brown, Kyle Langford and James Kelly were standouts. What a joy it was to call out Longey when Jake Long wove a bit of magic and loudly applauding Joey Daniher when he found the target. The last quarter was a bit nail-biting. The Dons were up by six goals but Carlton suddenly looked like the wanted to play footy and continually got the ball out of the centre. Thankfully they forgot where the goals were and found ways of scoring behinds instead of majors. When Essendon scored again mid way through the last quarter we had extra breathing space and held on for their best win of the season against the “old enemy”. But my day of joy didn’t finish then. I had the pleasure of meeting up with the Rod, Rob, Michael and Lib better known as the Carlton Four after the game at the Royal Oak. Notwithstanding the fact they tried to hide from me in the hotel, they were gracious losers and shouted thirst quenching ales to the victor, me. They had serious doubts about the future of their club, agreeing that the Carlton Football Club are about five years away from being a power again and suggesting that Essendon are years ahead of them. With most of the Essendon suspended players signing on to come back next year, I can only agree with their wisdom. Just think, those champions that have just had a year off, are fresh and injury free and joining up with the new finds of 2016. So OK, 2016 hasn’t been too flash, however being a Tragic Don in 2017 may have a lot going for it. Crowd 46566 at the “G” on a Saturday arvo. The Royal Oak would have been good fun. That’s a top-shelf stir of Carlton, too. 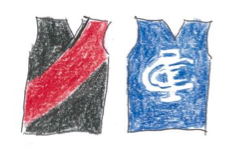 Essendon closer to their next flag than Carlton..? My inference from Rod’s assessment (hope/wishful thinking) was that he is anticipating a Bombers’ flag in 2017, and the Blues to salute in 2018. OK, Dons in 2017, but I’m afraid (according to the Carlton Four) the Blues sometime around 2023/24/25. Now doesn’t that sound sweet? Fab report as always Rod! I didn’t find out we had won until after the match. I was at Cape Tribulation in the Daintree in QLD and was out of radio, phone, internet range for the match which was frustrating. It certainly was a pleasant surprise to get a text message from my daughter informing me the Bombers had won as I was leaving the rainforest and heading back to Cairns. There is something special about beating the Blues especially in such an emphatic manner as occurred. We certainly do have a lot to look forward to next season, in fact, it may be embarrassing trying to give everyone a game. A nice thought anyway!